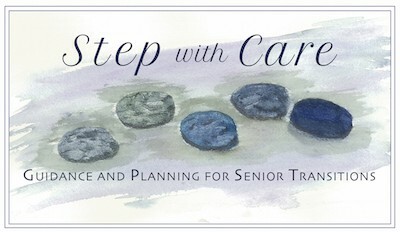 Step with Care LLC provides customized recommendations and a range of services to individuals transitioning to an independent living community, assisted living community or skilled nursing facility in the Greater Boston area. My initial consultations with seniors and their families identify important preferences and priorities, as well as medical, financial and other requirements. Based on these discussions, I identify options that best meet your specific circumstances and criteria, and will then develop and assist in the implementation of a personalized transition plan. I am a Certified Senior Advisor® with 15 years of experience as a consultant, project manager, and researcher in the work/life field, partnering with employees and employers to understand challenging issues and design programs to support balancing career and personal responsibilities. My professional experience, combined with years of supporting family and friends struggling to navigate the significant and often unplanned challenges of caring for elderly or dependent adults, strengthened my resolve to provide services addressing this growing need. Many people grapple with questions such as: How do we care for this person? What’s the most appropriate living environment? What costs are involved? Are we making the right decisions? Caregivers are often both physically and emotionally exhausted, and benefit from the support and organization I provide when considering what is often an overwhelming amount of information. Oversee the logistics of a move, including downsizing and sorting through belongings. I look forward to working with you and your family to navigate this important transition. If you’re considering a future move or are facing an urgent need to make decisions immediately, please contact me to schedule a free consultation.